I’m always saving my pennies to purchase books, so I rarely spend money on seeing movies. Well, that and the fact that I like to support my local library by checking them out. With that being said, I still didn’t have to dig in to my Mason jar of book funds thanks to the generosity of my Aunt Deniece. She bought tickets for me and my son to see In Our Hands. In Our Hands is the docudrama commemorating the 50th Anniversary of Israel’s Six-Day War. The movie features historical footage, personal interviews, and professional reenactments celebrating Israel’s 55th Paratroopers involvement in the battle for Jerusalem. The barely twenty year-old nation of Israel staved off extinction at the hands of surrounding Arab nations determined to wipe Israel off the map. Israel’s defense forces risked everything, taking on better equipped, larger military forces, for the sake of their homeland. The unexpected Israeli victory returned the Jews to the Old City of Jerusalem and the Western Wall of the old Temple. Israelis celebrate Jerusalem Day every year in honor of the sacrifice made in June, 1967. 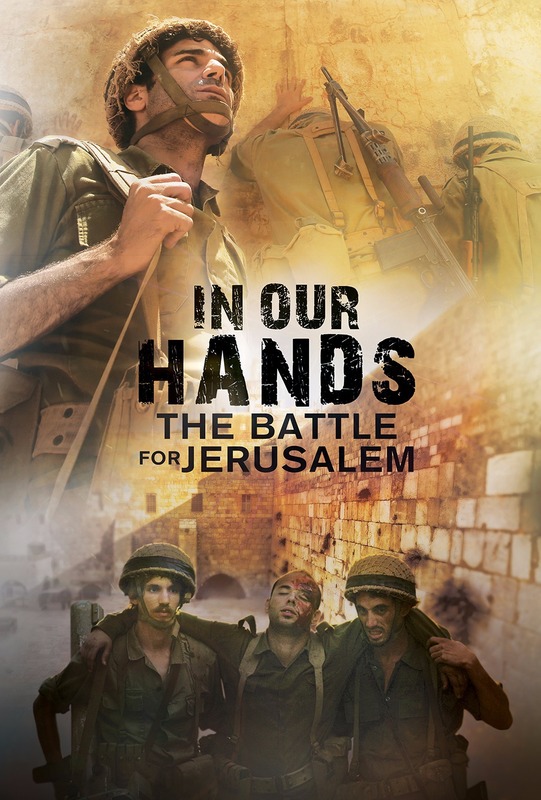 The title of the docudrama comes from Lt. General Mordechai “Motta” Gur’s famous statement broadcasting that the “The Temple Mount is in our hands!” The movie does a wonderful job recreating this scene sure to give anyone goosebumps. Equally miraculous is the scene of Israeli soldiers praying the Shema at the Western Wall. I highly recommend viewing this amazing, must-see movie. I’m pretty sure I’m going to have to own this one.